Jonathan Cano: This problem is of the capturing race (or seki) variety. Black to play: what happens? I saw this position come up in a game between a 2 kyu (White) and a 6 kyu (Black) on KGS. 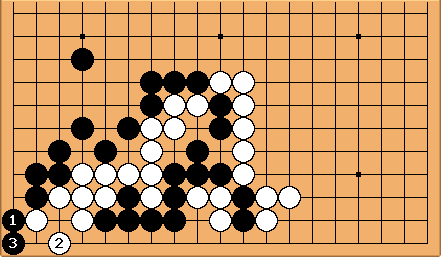 Black played 1 and 3. Later he died. Black 3 is a mistake in my opinion. I explored this position after the game (using KGS's wonderful ability to load any game and edit on the server) and found it quite interesting.